Home / Communication / Positive Reinforcement or Damaging Declarations? Adoring our children with love and praise couldn’t be a bad thing, could it? Well, it mostly depends on why we’re doing it. Positive reinforcement with toddlers is practically instinctual. 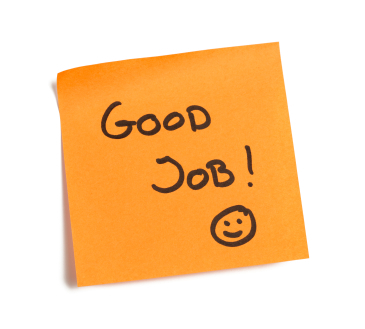 “Good job!” is a phrase my husband and I often exclaimed, usually after our daughter had done something rather benign and developmentally appropriate, but to us was the most brilliant thing in the world. You know, like when she put on her shoes by herself or her pants – even though they were backwards. It proved an amazing feat of concentration and we just wanted to show her that we were proud of her so that she would know that we loved her no matter what! I don’t mean to criticize the loving intuitive expressions of appreciation and excitement – only to examine the praise we use to manipulate our kids into repeating a desired behavior. Sure we think it’s great that Sam just shared his toys and it was exciting that Mia cleaned up her room without asking but how we share our appreciation can be tricky. I know it seems inconsequential. A “Good job eating all your dinner!” – here or a “You’re such a good girl for helping!” – there, especially with our young ones, seems innocuous. Positive reinforcement appears to be the most popular and effective form of toddler discipline, next to distraction – especially when faced with a time consuming search for alternatives to the more assertive discipline methods. But, studies show again and again that kids who are praised for their behaviors tend to become more hesitant and unsure of themselves, less interested in trying new things, and worse, they actually lose interest in the activity they were previously praised for – once the praise stops coming. I do not mean to discount the beneficial aspects of “positive discipline” nor do I mean to bemoan all praise and rewards. To exclaim your heart-felt excitement the first time your toddler puts on her shoes by herself is a perfectly legitimate reaction but to blurt out “Good Job!” as a knee-jerk response to the most negligible of activities (eating, drinking, coloring, jumping, swinging) in hopes [however unconscious] that our children will repeat the desired action in the future is detrimental to their overall ability to learn and self-motivate.